Sadler offers the best-in-industry Accident and General Liability insurance for youth and adult kickball teams and leagues, tournaments, and camps & clinics. As a general rule, recreational kickball leagues experience relatively few serious injuries. 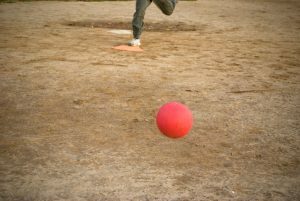 Common kickball injuries are ankle sprains, pulled hamstrings and calf muscles, and knee injuries. Injuries resulting from too much play or playing through pain are tendonitis, growth plate injuries and stress fractures. A first-aid kit and someone trained to administer it should be available at all practice and game fields. A plan should be in place to contact medical personnel for immediate assessment and treatment of concussions, fractures, dislocations, or other serious injuries. The playing field should be free of debris and obstacles that interfere with play and could cause trip-and-fall accidents. Uneven surfaces and depressions are a common cause of kickball related injuries. The field should be adequately lit for night games. One of the major risks in adult kickball is players who are past their prime overexerting themselves, which all too often results in pulled muscles, strains and sprains. It’s important that players take the time to warm up before play to reduce the potential for muscle strain. 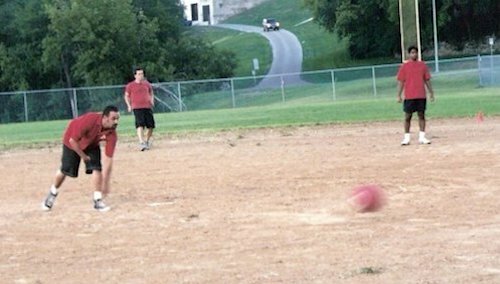 Another area of concern in adult kickball is players under the influence of alcohol, which should be prohibited before and during competition. Players who are under the influence are more susceptible to falls and other injuries, and the potential for disagreements escalating to physical confrontations and fights increases considerably. Team/league-sponsored social activities that include alcohol, such as after-game dinners, end-of-season parties, etc., should be held in restaurants and bars where wait staff serves the alcohol and take on the liability risk. BYOB should be discouraged. Teams/leagues that sell alcohol for a charge run the risk of voiding their host liquor liability coverage under General Liability policies and should consider purchasing a separate Liquor Legal Liability policy.